Climbers descend the Easton Glacier after a successful summit of Mt. Baker, the Black Buttes ahead of them and the Puget Sound out on the horizon. Michelle Curran. The Outdoor Life Network included this course in a recent series on America's Top 10 Adventure Sports Camps. Although this is definitely not a "camp" in the traditional sense, rather it is a rigorous alpine climbing course with small groups (maximum 10 climbers) in a remote wilderness setting. It is one of AAI's classics and perhaps the most comprehensive one-week climbing course in the nation, unbeatable for its combination of fun, learning, and achievement. Alpinism 1 from John Grace on Vimeo. The course provides a complete introduction to off-trail alpine travel and to all the fundamental skills of rock, snow, and ice climbing. We spend one day in an easily accessible rock climbing area, and five days learning and applying the skills of glacier travel and snow and ice climbing. On the fifth day, we set up a high glacier camp (with some of the most remarkable mountain and ocean views in America), and on the final day, we climb to the rugged, ice-encrusted summit of 10,778-foot Mt. Baker. The Intro to Alpinism course is conducted largely above timberline in the high country of North Cascades National Park and Mt. Baker National Forest. Distances covered while backpacking into our base camps are kept to a minimum, usually about four miles, because of our emphasis on skills development and practice climbing. You'll come away awed by the terrain you have seen, proud of your accomplishments, and you will have the knowledge and experience to be a skilled rope team member on climbs of intermediate difficulty. You'll enjoy our expert guides and instructors and you'll be impressed by how much you enjoy and accomplish in a week with us in the mountains! To help them understand and protect the fragile alpine environment. We work hard to instill in participants an appreciation of both specific concepts and specific techniques that will allow them to travel through and climb in alpine areas skillfully, confidently, and without leaving a trace. Upon completion of the program, each participant should be qualified as a technically competent rope team member capable of making alpine mountaineering ascents on routes of intermediate difficulty. This course is intended to serve as an intensive and complete introduction to off-trail alpine travel, and to all the fundamental alpine mountaineering skills of rock, snow, and ice climbing. The course is presented in the most highly glaciated area in the conterminous forty-eight states and offers exposure to an unusually large variety of landforms and climbing surfaces. Groups are small and individual attention is very great, allowing instructors to respond to participants who are progressing at different rates or who want emphasis on different parts of the curriculum. We meet at AAI's headquarters in Bellingham, WA to check gear and take care of any rental equipment needed. We spend several hours on equipment, answering questions, and making sure everyone has what they need to make the week a success. Climbers coil their rope at the end of a great day at Mt. Erie. Throughout the program we discuss the ethics of Leave No Trace (LNT) travel, camping and climbing, and employ LNT techniques in all that we do. In addition to working on the "hard skills" of snow, ice, and glacier climbing, we also cover the complexities of route finding and hazard assessment. We help each participant become proficient in the use of map, compass, and altimeter, perceptive in route finding and evaluation skills, and thorough in the assessment of objective hazards. Prussik practice for crevasse self-rescue. Glacier travel skills, including proper rope techniques and crevasse rescue, receive thorough attention. By the end of the practice sessions, each participant should be able to climb or prussik out of a crevasse and rescue a partner by using the mechanical advantage of a pulley system. On the final two days of the program, team members apply all the skills they have been practicing as we establish an advanced camp high on the Easton Glacier and then make a climb to the summit. 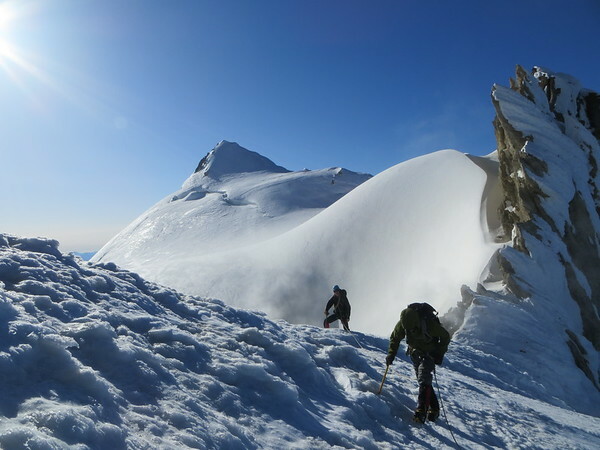 On the climb to high camp, we will travel through crevasse fields where good route finding is crucial and climb over both easy and moderate terrain where we apply a range of snow and ice climbing skills. The next morning we'll start climbing by 2:00am, taking advantage of the cool nighttime temperatures to give us the best possible footing on the glacier. Ascending slopes that are a little steeper than the previous day, we'll first climb to the lip of ice-choked Sherman Crater where we will see steam fumaroles rising from fissures in the ice. Continuing up Grant Peak, we will summit shortly after sunrise, and from Baker's highest point enjoy sweeping views that stretch from the Canadian border peaks in the north, across the islands in the San Juan archipelago to the west, and out to the hundreds of peaks in the Cascades to the south and east for a spectacular climax to a great week of climbing. Apr 29 - May 04, 2019 - 1 Spot Left! May 06 - May 11, 2019 - Waitlist Available! May 13 - May 18, 2019 - Waitlist Available! May 19 - May 24, 2019 - $1100 Special price! This session only! * -Waitlist Available! May 27 - Jun 01, 2019 - Waitlist Available! Jun 10 - Jun 15, 2019 - 1 Spot Left! Jun 16 - Jun 21, 2019 - 3 Spots Left! Jun 24 - Jun 29, 2019 - 1 Spot Left! Jul 08 - Jul 13, 2019 - Waitlist Available! Jul 14 - Jul 19, 2019 - 2 Spots Left! Jul 21- Jul 26, 2019- Women Only - 1 Spot Left! Jul 22 - Jul 27, 2019 - 3 Spots Left! Aug 05 - Aug 10, 2019 - 3 Spots Left! Aug 11 - Aug 16, 2019 - Waitlist Available! *The May 19 - May 24 session is part of our new instructor orientation. It will be overseen on the mountain by multiple Tenured AAI Instructors, but will also include new instructors practicing their teaching skills. If you lack overnight backpacking experience, you can add a 2-day backpacking and wilderness skills course at a discounted price and go straight into Alpinism 1. "Few things in life turn out to be as advertised. The Alpinism 1 program I just completed is one of those few, and more. It was an overwhelmingly positive experience. Our guides Alasdair and Richard are fine leaders and teachers. I felt comfortable and confident in their hands, and learned a great deal from them. I'm already looking forward to my next climbing adventure with you. Thanks for a marvelous time, and best regards." "We agreed our guide was the greatest. He instinctively knew where we were on our skill progression, what he needed to tell us, and what he needed to leave unsaid. His directions and demos were crystal clear and he was generous with his time and expertise. I have been taught /guided by a lot of great professionals in various adventure sports but based on the past six days, I think our guide was the best of all." "In my search to find the right organization to help me achieve my goal to climb Denali, I researched about ten guide services. American Alpine Institute met or exceeded all of the others in training, experience, and integrity. I would not consider climbing with anyone else but AAI." "I would not hesitate to come back and climb with AAI. My experience was wonderful and my guide was a true professional." "During the ascent of Mt. Baker, our guide encouraged us to explore our limits, but took great care to make certain that we never felt "in over our heads", and was very vigilant in protecting our safety."